Amber CufflinksThere are 7 products. Carefully designed and well made, amber cufflinks is an excellent choice for everyday use or special occasion. Cufflinks made from natural piece of Baltic amber can give you confidence and success. How about some gift ideas for man? Or maybe it is time to treat yourself! The real reason it doesn't matter is, just browse, buy and enjoy! This beautiful sterling silver and round amber stone cufflinks can be a perfect gift idea! Wonderful crafted amber cufflinks with piece of amber surrounded by silver. 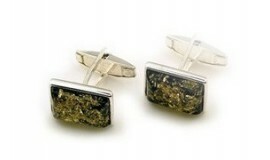 Amber cufflinks with each on of these green ambers is set in silver. Modern and very different cufflinks joined by a silver chain with two circular pieces of amber. Classic cufflinks with square amber stones set in silver. Increase a sense of trust in the future! Amber and silver cufflinks with double cylindered making them a stylish mens accessory.